Notre Dame’s Pat Connaughton is a rare breed of high-end collegiate two-sport athlete, with the unique combination of basketball and baseball excellence. Other two-sport greats of the past few decades have included football–baseball standouts such as Bo Jackson and Deion Sanders (more recently: the likes of former ND star Jeff Samardzija, plus current NFL quarterback Russell Winston and 2013 Heisman Trophy winner Jameis Winston). Another former Florida State quarterback, Charlie Ward, also starred in basketball and went on to play in the NBA. Notre Dame’s Pat Connaughton blocks a shot by Butler late in the 2015 NCAA round-of-32 game. Photo by Geoff Burke (USA Today), courtesy Notre Dame. 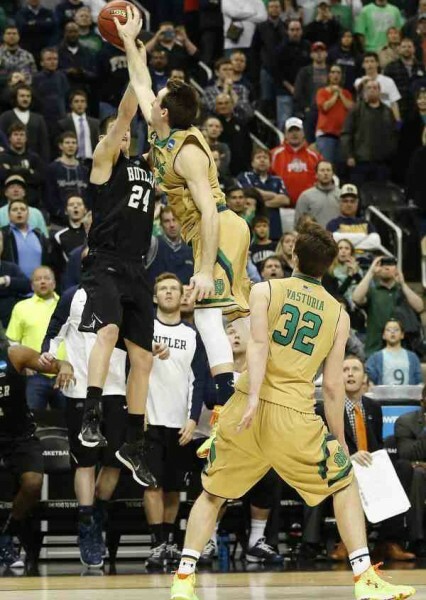 The 6-foot-5, 220-pound Connaughton – who interestingly played AAU basketball with Cooper Ainge and cites Cooper’s father, Danny Ainge, as a notable basketball–baseball two-sport star – has given NBA scouts plenty to think about in terms of his pro prospects. A 2014 Major League Baseball third-round selection of the Baltimore Orioles, Connaughton likely would have been drafted even higher, if not for the two-sport factor. The mid-90s fireballer spent the 2014 summer pitching in the Orioles organization. Earlier in the current college basketball season, Connaughton sat down with CB360’s Pete LaFleur for a video interview focusing on his two-sport career. It’s interesting to note that Samardzija’s older brother Sam serves as Connaughton’s agent, lending plenty of keen perspective as to the challenges, options, etc., facing an elite two-sport athlete. In this video interview, Connaughton shares some intriguing insights about his own career and reveals what he considers to be the most impressive combination for a two-sport athlete. He also notes that the mental challenges that come with life as a pitcher – “literally, being out there on an island” – have helped him immensely during similar tense moments on the basketball court. 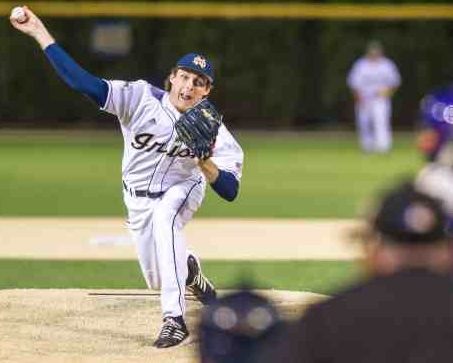 Pat Connaughton in action with Notre Dame baseball during the 2014 season (photo courtesy of Matt Cashore/Notre Dame). For those of you college baseball fans who rarely follow college hoops (even during “March Madness”), you might want to check out some of Connaughton’s recent basketball exploits: tremendous three-point sharpshooting, “sneaky” effectiveness as a rebounder, great court vision and movement without the ball, and even some clutch defensive plays … none bigger than his last-second block that possibly saved Notre Dame’s season in the NCAA round-of-32 vs. Butler (pictured above).